What are the checkpoints really checking for? ALL OF US want to fight and end drunken driving. Many in our community have met with the police department to find a way to work together to build and implement an effective anti-drunken driving program. Unfortunately, the checkpoints, as currently administered, are ineffective, expensive, discriminatory, divisive and operate outside the law. Checkpoints could be effective as part of a larger program to fight "driving under the influence," or DUI, but we do not support using them to conduct ID checks, selectively target members of our community and impound personal property. Rep. Babette Josephs: Josephs introduces bill to ban the human implantation of ID devices. HARRISBURG, Virg.-- State Rep. Babette Josephs, D-Phila., has introduced legislation that would make it illegal to implant any identification device on or under a person’s skin that would contain and transmit personal information. The bill (H.B. 2374) also specifies penalties for violations of the measure. Josephs said the risks to privacy that could occur as a result of such a device on any human, regardless of age or condition, would outweigh any possible benefit that could be derived. She also added that some medical experts believe such devices may contribute to causes of cancer. 'Maintaining our personal and our family’s privacy is becoming increasingly difficult,' Josephs said. 'Any positive impact that an implanted device could have would be eclipsed by the potential damage that could be done if the information was accessed by an outside party not intended to have the information. Moreover some of this information should not be collected by government either. Josephs said that implanting identification devices is part of a larger issue with the increasing number of technologies that can identify a person's personal information or location, including GPS, cell-site location and public surveillance. In the legislation, personal information would include name; address; contact information, including phone number and e-mail; date of birth; driver’s license; Social Security or state identification number; religion; ethnicity; fingerprint or any other unique identifier. A person found in violation would be subject to a civil penalty of up to $10,000, dependent on how long it takes the offense to be corrected. The person who had the implantation would also be able to bring a civil action against the guilty person for actual damages. The bill was voted out of the House State Government Committee unanimously on Monday without amendment and now moves to the full House for consideration. Big thanks to Aaron Bollenger for giving us a heads up. 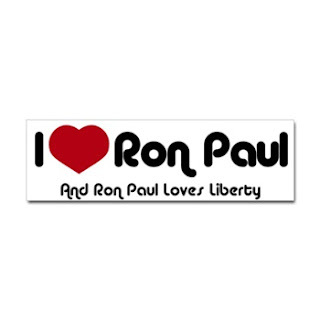 It's a love fest right now for Ron Paul voters for permissions to rest on Chuck Baldwin. What else can we say to that? "We've been hammering it," said Shane Cory, Barr's deputy campaign manager. "When this first came about with Fannie Mae and Freddie Mac, Bob was explaining, 'When we bail out Fannie and Freddie, expect more to come.'" Barr, the former Republican congressman from Georgia who is running as a Libertarian, now sends out press releases lambasting the administration for indulging in corporate welfare, festooned with headlines such as "I told you so." "This administration, supposedly devoted to free markets and fiscal responsibility, has bailed out the housing industry, the quasi-government mortgage companies Fannie Mae and Freddie Mac, the investment house Bear Stearns, and a leading insurer," read a Sept. 17 statement. "And how will we pay for this ever-rising bill for corporate welfare?" The Nader campaign asserts that the independent candidate's prescience in predicting the current meltdown dates back more than a decade. "Ralph has almost prophetically predicted over the last 15 years of deregulation, what the effects might be," said Toby Heaps, a Nader spokesman. "When Clinton removed the need for banks to pay annually into the FDIC, [Nader] predicted the FDIC might be short on cash and taxpayers would need to bail it out." In an interview with Politico last week, Nader emphasized many of the same issues, calling the Federal Reserve "a government within government" that is unaccountable to the public or to democratic institutions. He also said that the current round of bailouts was worse than the Chrysler Corp. rescue of 1979 because it does not impose sufficient conditions on the companies or benefits to the government. Nader is "not unequivocally opposed to bailouts, but he's opposed to those without reciprocity," explained Heaps. "For Chrysler, the government received stock warrants, so when the company recovered, government made a $400 million profit. What happens today is people bow to what big business asks for without conditions whatsoever. He's opposed to unconditional bailouts like this one." "Barr supports letting the free market run its course," said Cory. "We're getting more people signing up for the e-mail list, donations are up, our press releases are being carried more widely," said Cory. And although major media appearances remain somewhat elusive, there has been a notable uptick. The Nader campaign reports that it hasn't been as fortunate. "I have never in my life seen someone so in the sweet spot of a story and get so little coverage," complained Heaps. "We've had some articles in small papers but nothing in the major media except a hit on Fox." Paul, like Nader, asserts that recent events prove the correctness of his economic philosophy. "He thinks this is a long-term crisis that has been unwinding since 1971," said Jesse Benton, a Paul spokesman. Paul shares Barr's and Nader's view that the government's response has been inappropriate. The bailouts "prop up a bad system," Paul said on MSNBC Thursday afternoon. "All they've tried to do is patch up a system that is unworkable." WASHINGTON — Libertarian presidential nominee Bob Barr's campaign filed suit Tuesday seeking to remove Republican John McCain and Democrat Barack Obama from the ballot in Texas, alleging that the two major candidates missed the deadline for officially filing to be on the ballot. The lawsuit by the former Republican congressman from Georgia claims that neither McCain nor Obama met the requirement of Texas law that all candidates provide "written certification" of their nomination "before 5 p.m. on the 70th day before election day," because neither had been formally nominated by their respective parties in time. In Austin on Thursday, Barr accompanied his attorney to request an emergency order from the Texas Supreme Court to stop the state from mailing absentee and military ballots, which is expected to start Saturday. (Barr's attorney, Drew Shirley, is also the Libertarian nominee for a Texas Supreme Court seat.) The court denied that request by the end of the day. SB 60 conforms California law with the Federal Real ID Act of 2005. Wherever your stance on immigration the breakdown of SB60 is the same. "Politics makes strange bedfellows," someone wise once said. Such is the case ALIPAC is an anti-illegal immigration that believes that Real IDs do not solve "the immigration problem" . Arnold is about to sign away the identity rights of Californians. We have to call a stop to it. SB60 will put every Californian at risk for identity theft, enter them onto a biometrics grid, enters the state of California into an illegal business compact with Mexico (or Canada), and threatens to undermine National Security by adding public officials social security numbers and private information into an insecure database where it can be accessed by identity criminals. There are plenty of reasons to support the opposition of SB60. One way is to hold Swarzenegger to a campaign promise. Today, and each day this week, we need all of our national volunteers to make one important call and send one e-mail. WE NEED ALIPACers IN ALL STATES TO RESPOND TO THIS NEED IN CALIFORNIA! The myth that the Real ID Act was designed to stop illegal aliens from receiving licenses was destroyed, when TN started giving illegals Real ID compliant licenses two years ago, and again this year when defamed Governor Eliot Spitzer tried to give Real ID compliant licenses to illegals. We won in TN and NY state by stopping their plans to give illegals Real ID Compliant licenses. Some ALIPACers support Real ID and others do not, but we want to make sure that everyone knows Real ID is not designed to stop illegals from getting licenses. It is most likely that Real ID is your new continental ID. The California legislature has passed SB 60 which will give illegals licenses. The bill now goes to the Governor's desk to be signed. If the Governor signs this bill, California will become the first state in America to pass a law in 2008 establishing a benefit for illegal aliens. It will also become the first example reversing the trend of cutting licenses off from illegal aliens. In the last year, ALIPAC has helped to reverse state policies of giving licenses to illegals in Oregon, Michigan, and Maine. The pro-amnesty crowd in California is responding to growing pressures on the license front! We need you to call and e-mail Governor Schwarzenegger and remind him of his campaign promise NOT TO GIVE LICENSES TO ILLEGAL ALIENS! Please use this contact information and review our sample message. PLEASE CALL AND DELIVER YOUR MESSAGE BY PHONE AND THEN FOLLOW-UP WITH A WRITTEN LETTER, E-MAIL, or FAX for maximum impact. If you do not call, our chances of blocking this bill diminish greatly. Call and write! I am writing to ask you to veto SB 60 and to prevent illegal aliens from receiving any form of a driver license as you promised, when Californians elected you over Gray Davis. In fact, it was public anger against Gray Davis and licenses for illegal aliens that swept you into office! Over 80% of the American public does not want illegal aliens to receive ID, Licenses, or any taxpayer benefits from the state! That is why a historic number of states have passed laws cracking down on illegal immigration in 2008. Of the few remaining states that give licenses to illegal aliens, Oregon, Maine, Utah, and Michigan have all abandoned the process this year! Please do not let California become the first and only state in 2008 to pass a law that defies the will of the vast majority of Americans by providing licenses or benefits for illegal aliens"
In 2005, Congress passed and President Bush signed the Federal Real ID Act of 2005. The Act requires that states retool their system of issuing driver's license to ensure uniformity among all states and greater security regarding both the license itself and the identity of the person to whom it is issued. States must begin issuing Federal Real ID compliant licenses by May 2008. California has a population of approximately 2 million undocumented immigrants who live and work in our state. In 1993, California stopped issuing driver's licenses to drivers that could not prove legal residency. Persons who can not show proof of legal residency currently drive on our roadways without being tested, licensed, or insured. What does SB 60 do? First, SB 60 enables California to meet the minimum document design and security requirements set forth in the Act in order for driver's to have a federally recognized driver's license. These new federal requirements ensure, among other things, that all states have the same information about the driver on the license, ensure that the license is manufactured in a secure facility, and that the document itself has security features designed to prevent counterfeiting. Secondly, SB 60 conforms California law to the minimum issuance standards of the Federal Real ID Act by requiring all applicants for a California driver's license to meet the minimum identity requirements for a federally recognized driver's license. These requirements include presentation by an applicant, and verification by the DMV, of a picture ID; a document showing a date of birth; proof of a social security number or verification that the person is not eligible; proof of address; and evidence of lawful status. Lawful status includes 1) citizens; 2) lawful permanent residents; 3) conditional permanent residents; 4) persons with approved applications of asylum; 5) persons with a valid, unexpired nonimmigrant visa; 6) persons with pending applications for asylum; 7) persons with a pending or approved application for temporary protected status in the U.S.; 8) persons with an approved deferred action status; and 9) persons with pending applications for adjustment of status to that of an alien lawfully admitted. Applicants that have lawful status with documents 5) - 9) are eligible for temporary licenses that expire in 1 year but can be renewed upon verification, from the Department of Homeland Security, that the person's status has been extended. The DMV must verify all documents and the only foreign document that can be accepted is an official passport. Further, SB 60 conforms California law to the optional provisions of the Federal Real ID Act by providing a "driving only license," that is not recognized by the federal government for identification purposes, and clearly states on its face that it cannot be used by any federal agency for federal identification or any other official purpose. This document must also have a unique design or color feature, as required by federal law. This "driving only license" is available to applicants that cannot meet the minimum identity requirements required for a federally recognized driver's license. Holders of this "driving only license" cannot use their license as identification to enter federal facilities, boarding federally regulated commercial aircraft, entering nuclear power plants or any other purpose as determined by the Secretary of Homeland Security. Mexican American Community Services Agency, Inc. Without a TWIC, your license is invalid. Don't think you can wait. This whole program has been plagued by confusion, delays, and poor communications, especially on the part of the USCG, who at the local level are barely up to speed on this issue. I still see Internet forums with captains quoting local CG personel that they won't need a TWIC. Do not make the mistake of going to the USCG for advice about the TWIC. The USCG has made their official position very clear with the NVIC quoted above. Friends don't let friends get TWIC'ked off and drive, fly or maneuver dangerous machinery.